When I’m working out, I’m all about doing cardio first—then I go about with my strength training routine. It just feels right to me to get my heart rate up by running and follow that by lifting a few weights. On the flip side, I know people who are adamant about doing things the other way around. Then, there’s the Barry’s Bootcamp lot who intersperses cardio and strength training together. So what gives with all the different sequences, and which one should you do first to make the biggest impact in your workout? Nolan agrees, noting that “the best exercise is always the exercise that you’ll do.” But if you’re still curious about the difference between workout sequences and benefits, keep scrolling. If you hit up an elliptical, spin bike, or tread first thing, you’ll reap some very specific perks. First off: It’s the best bet if you’re training for a race or looking to improve your running game. “If your goals are improving better running times or if you’re training for a marathon, or looking to improve your endurance, then cardio first is a great option,” says Samuela. Also, doing cardio first means you’re more likely to slay it, rather than having heavy legs later on. “By running first while you’re fresh and ready for it, you will perform better than if you do your strength exercises first,” says Nolan, who adds that doing strength first can make the cardio session feel harder than it really is. Keeping cardio second also allows you to really go all out with your strength training routine—so do this if you’re looking to build muscle or work on your strength. “Lifting weights is comparable to sprinting—it involves short bursts of extreme effort, and requires that your muscles use an energy source other than oxygen to perform the exercise,’ says Nolan. “Depending on your fitness level, your muscles and heart can only handle a set amount of anaerobic training before becoming tired.” And so if you’ve gone all-out in a cardio sesh, he explains that you won’t have as much energy left to build strength. Samuela agrees, saying that doing cardio first can make it hard to lift heavy afterwards. “If your focus is really working on your booty or your legs, for instance, I’d definitely recommend starting with strength because you’ll have more energy,” she says. So then that leaves the whole cardio-strength switch-up sequencing in which you hop into one, then the other, then back again, keeping each component of your workout at a limited length. “If your focus is on general fitness, that’s when you can mix up your workout with 15-15 or 10 on 10 off,” says Samuela. Or maybe you’re the type of person that easily gets bored during a workout, when doing one thing for a sustained period of time. This way is also ideal for you: “If you easily get bored, that’s where this comes in as a good option,” she says. “Go back and forth, mix it up, and make it more interesting.” You’re the boss. 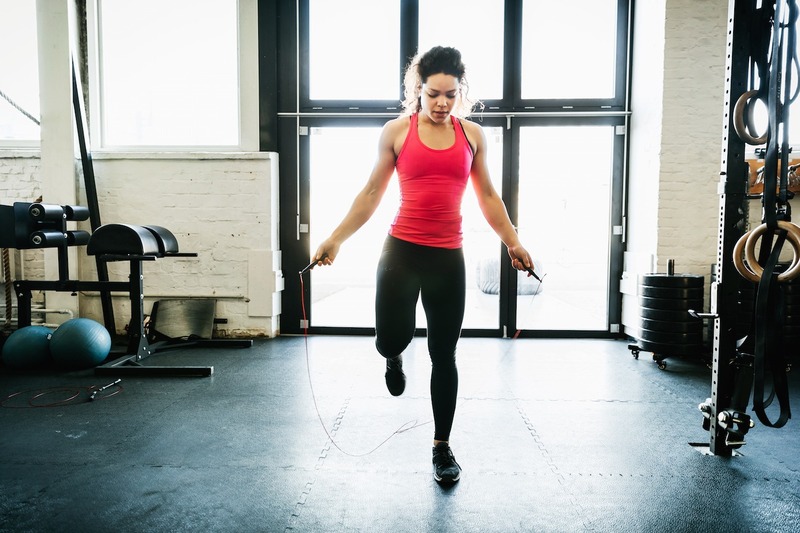 If you’re on the market for different ways to spike your heart rate, try this weighted jump rope out. Or, hey, there’s always ecstatic dance for your cardio needs.